I always feel like I am in the middle of changing one of my spaces, but in reality I guess I always am. We've been working on our home office for about a year on and off and really haven't gotten too far. It's a tricky space since it serves as an office for 2 people (me and my hubs) and it doubles as our guest room. This bookshelf lives there now as well as this desk. We're getting there slowly but surely. It was perfect timing for Apartment Guide to contact me in regards to their "Your Picks. 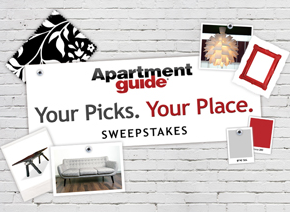 Your Place" Sweepstakes. Right now they are in round three of their sweepstakes - HOME OFFICES. I loved all of the choices, but one in particular really gave me inspiration! Check out the sweepstakes here. Can you guess which one? Check out the official information below and enter to win one of their eight $250 weekly prizes or their grand prize of $10,000. All you have to do is vote to be entered to win! Apartment Guide and owner Consumer Source, Inc. partner with bloggers such as me to participate in blogger programs. They did not tell me what to purchase or what to say about any products and believe that consumers and bloggers are free to form their own opinions and share them in their own words. Consumer Source’s policies align with WOMMA Ethics Code, FTC guidelines and social media engagement recommendation.